Small difference, large effect: Most biological molecules occur in two variants, an original and its mirror image. As a result, they are related to one another like the left hand to the right. For instance, the left- and right-handed variant of the same molecule makes lemons smell different from oranges. This so-called chirality also plays an important role in pharmaceutical research. Working in close collaboration, physicists from the Max Planck Institute for Nuclear Physics and chemists from Heidelberg University have now developed a method which, so to speak, takes a snapshot of chiral molecules and so reveals their spatial atomic structure. The molecule's handedness, or chirality, can be directly derived from this information. Many biological processes are entirely dependent on whether the participating organic molecules are left- or right-handed. 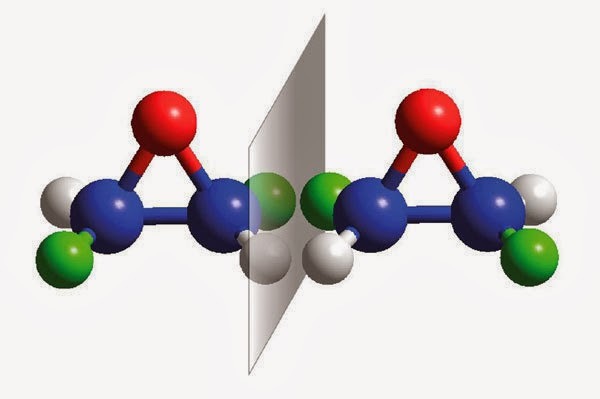 Researchers refer to molecules which occur in two forms that are the mirror image of one another as "chiral" molecules. Scientists would therefore like to know how the atoms are arranged relative to one another in such molecules. In scientific jargon this is known as the absolute configuration, and it can be used to identify the molecule's handedness. While methods for determining the handedness of chiral molecules are indeed available, they do not reveal the absolute configuration without making use of theoretical models. Moreover, no measurement method has previously been available which is capable of investigating the handedness of individual chiral molecules in the gaseous state. The researchers working with Holger Kreckel and Andreas Wolf of the Max Planck Institute for Nuclear Physics and Oliver Trapp from the Institute of Organic Chemistry at the University of Heidelberg have, for the first time, been able to determine the sense of handedness, or chirality, of a gaseous sample, a chiral epoxide, by directly imaging its molecular structure. To this effect, Trapp's team of chemists firstly produced a compound with defined handedness by transferring the handedness of a derivative of naturally occurring tartaric acid onto the target molecule dideuterooxirane. Kreckel and his team then carried out their measurements using minuscule quantities of this substance in highly dilute concentrations. The team at the Max Planck Institute for Nuclear Physics took the electrically neutral molecules and produced ions with a single positive charge by removing a single electron from each molecule. These ions can be boosted to very high speeds in a particle accelerator. The accelerated ions then pass through a very thin diamond foil. In under one femtosecond (one millionth of a billionth of a second), the foil strips the binding electrons from the molecules. All that remains are highly charged atoms which vehemently repel one another. Having lost the electrons that "glue" the molecules together, the fragments now fly apart. After passing through the foil, the fragments move further apart from one another. However, the atoms retain their relative positions. As the time of flight increases, an ever larger, three-dimensional image of the molecule, retaining the underlying geometry, is obtained. Once it reaches a 3D detector, the image of the molecule has already grown to a few centimetres in size, and the detector records this structure. In order to meet the demanding requirements which apply to measuring chiral molecules, the detector arrangement was optimised to detect up to five fragments at once. The image on the detector shows the absolute configuration which in turn directly reveals the molecule's handedness. The pioneering work for this multiparticle "Coulomb Explosion" detection scheme was carried out at the Weizmann Institute in Israel. "The way the experiment is set up, it would also permit the investigation of chiral fragments of molecules", explain the researchers. This is because, in the described experiment, a mass-selective filter upstream of the diamond foil selects molecule fragments of a desired mass. The filter can be adjusted such that only the chiral fragment of interest is directed onto the foil and is thus recorded by the detector. It is precisely this combination of mass spectrometry with a Coulomb explosion measurement that the researchers believe will be attractive to future applications with chiral molecules. In future, the Heidelberg-based researchers are hoping to expand their expertise in detecting the handedness of chiral molecules. They already have their eyes on another method in which the chiral molecules are accumulated in an ion storage device prior to the Coulomb explosion.